Charlotte is thrilled to be back on the road with Lonesome Traveler and Peter Yarrow & Noel Paul Stookey (of Peter, Paul and Mary)! New tour dates started up at the end of September in Queens, NY and will continue through April 2019. Click here for more information about dates & locations. In addition to acting, Charlotte is a singer-songwriter and is constantly releasing new music and playing sets around New York. She is also currently on an acoustic tour of her own music! Learn more about Charlotte’s music and where she’ll be playing next. Once just wasn't enough! Charlotte will be joining the cast of Once once again, this time in San Antonio, TX. She will be reprising the role of Reza with the Public Theatre of San Antonio in May/June 2019. Charlotte had so much fun recording songs for the soundtrack of the children’s musical Pip’s Island, which is currently running in New York. You can hear Charlotte rock out on ‘Bubble Up’, ‘Lift It Up’ and ‘Gonna Be a Hero After All’. More info coming soon on where to listen! Charlotte could not have asked for a better way to kickstart her venture into the music industry. On September 29th, Charlotte performed her first solo NYC concert of all original music at Feinstein's/54 Below. This concert capped her 2018 Project, To New York, with love* and included songs from her recent EP* as well as songs written over the last 10 years. Photos and video coming soon! *For more information on the full To New York, with love project as well as Charlotte’s EP, see June and January 2018 News. Charlotte had so much fun back home in Philadelphia performing in Behold Her as a part of the Philadelphia Fringe Festival. Charlotte took up her many instruments to play Miriam, the on-stage actor/musician in this beautiful piece about Jewish women and beauty. The show ran at The National Museum of American Jewish History. Read the rave reviews! Thank you to everyone who joined Charlotte at the Camden Waterfront on Saturday, September 15th for the Delaware River Festival. Charlotte performed a mix of original music and covers and even snuck her music into the back of a 6ABC new segment! Pictures and videos coming soon. View Charlotte’s music website below for more upcoming performances. Finally back in NYC, Charlotte had such a blast performing at New World Stages on August 15th in Adulting: a stumble through life's freshman year. Alongside a number of her Northwestern friends, Charlotte sang about the ups and downs of her first year out of college. Charlotte performed an original piece, 'City That Never Sleeps' off her recent EP, To New York, with love. Video coming soon! JUNE 1, 2018 - Charlotte's debut EP, 'To New York, with love' is now available for streaming and purchase! The 5-track EP, described as 'feel good/inspirational' (Caesar Live n Loud), is 'just the beginning of the rise of Charlotte Morris' (Keep Walking Music). JUNE 15, 2018 - You can also now watch the official music video for City That Never Sleeps, the second track off of the EP. Charlotte had an amazing time playing Reza in Once at the Oregon Cabaret Theatre in Ashland, OR! Critics said of the production: "It's funny. It's moving. It's natural and utterly real." and that "once may not be enough". Read what they're saying about Charlotte! The production ran April 26th - July 1, with numerous added performances due to such a high demand. It was a beautiful 3 months in Oregon, but now it's back to NYC! When Charlotte moved to New York in June 2017, she started working on a project called To New York, with love. The project includes a 5-song EP, a music video and a solo concert of original music. Thank you to everyone who contributed to the Indiegogo fundraising campaign, making this project possible! The EP was released on June 1; the music video was released on June 15 (both featured under June 2018 News). 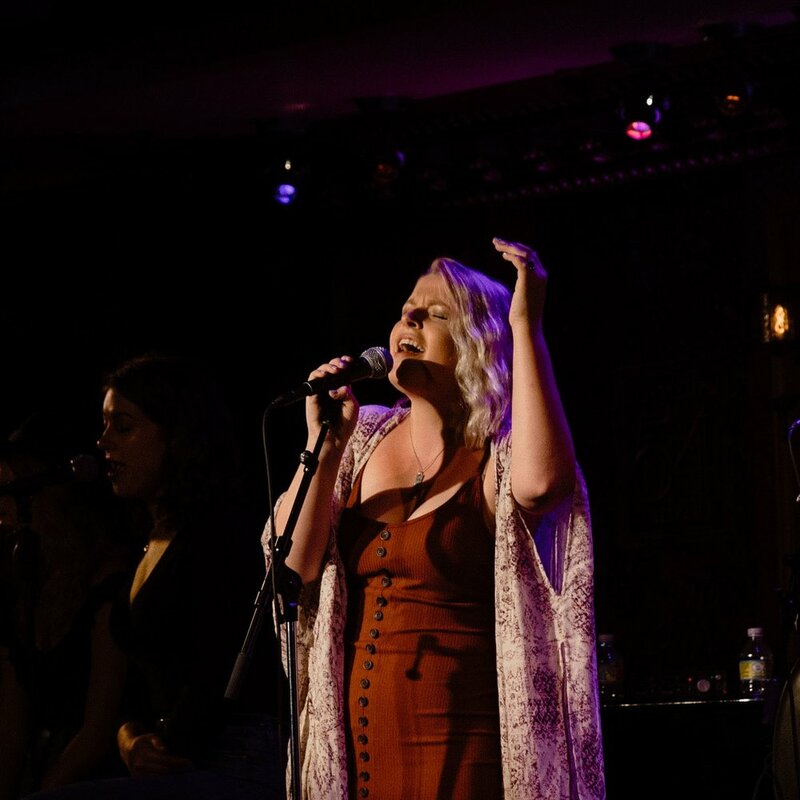 The concert took place at Feinstein's/54 Below on September 29, 2018. In January, Charlotte joined the cast of Lonesome Traveler in a concert tour of the hit off-Broadway musical. Through March 30th, Charlotte toured the country with this amazing cast and special guest, Peter Yarrow. This was truly a dream come true, as Charlotte grew up listening to all of the folk legends, in particular, Peter, Paul and Mary. Production photo/video and reviews coming soon! After too long a hiatus, Charlotte performed with Brian Falduto & Friends on January 8th at Rockwood Music Hall. Charlotte is wishing Brian the best of luck as he jets off to the west coast for the winter - maybe she'll join him for a bit?! Charlotte had a boozy blast performing at Ian Connor's "Holla Dayz: All I Want For Christmas Is Booze", a Christmas Cabaret featuring all the favorite holiday hits. Charlotte sang I'll Be Home by Meghan Trainor and played alongside Michael Mott on his Christmas original, Christmas Will You Stay. Videos from The West End Lounge performance are now available on Youtube. For more information, check out the feature on BroadwayWorld.com. Charlotte made her Joe's Pub debut on November 27th, playing and singing the original music of Chris Anselmo, a fellow Northwestern grad. The concert, presented in part by Musical Theatre Factory, was a huge success with tons of friends and NU family in the audience. Charlotte had so much fun and can't wait to return to the Joe's Pub stage. Here is a brief clip from the show - more to come!